MIAMI (May 1, 2018) — Carnival Foundation, the philanthropic arm of Carnival Corporation, celebrated the end of April’s National Volunteer Month by renovating several areas at the Kendall location of Boys & Girls Club of Miami-Dade. More than 200 students and mentors from Carnival Foundation’s Scholarship and Mentoring Program gave their time and talent to make the center more welcoming and vibrant for the kids and staff. The Carnival volunteers added new landscaping, painted the parking lot, cleaned up the playground and gave a fresh look to the offices and game room. 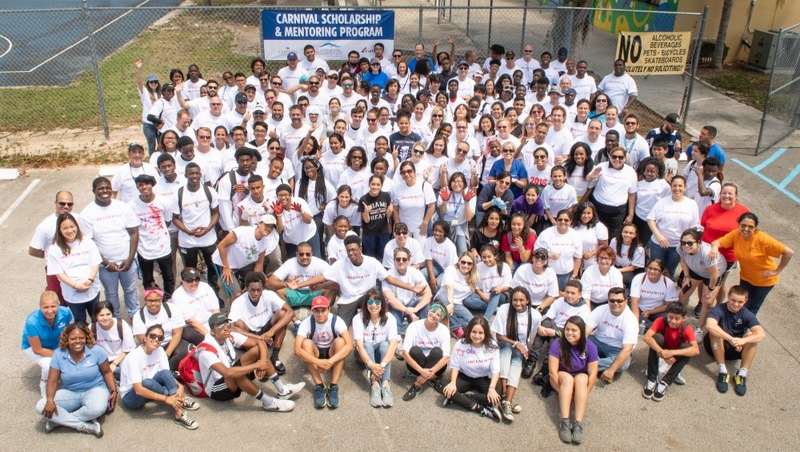 This is the first time that students who participate in the Carnival Scholarship and Mentoring Program volunteered in a community project with their Carnival-employee mentors. The Carnival Scholarship and Mentoring Program is an in-the-workplace mentoring program that pairs high school students with Carnival employee volunteers for their four-year high school experience. During the school year, participants visit Carnival’s headquarters once a month to shadow and observe their mentors in an office environment.